Subject: Uploading of orders/circulars on India Post Website – reg. Circulars issued by this office about rulings and other orders reach circle offices, regional offices, divisional offices, sub-divisional offices and further to concerned officers/officials and to Post Offices by post through HOs,SOs and BOs and this process takes lot of time. 2. These circulars and orders are uploaded on India Post website also. However, in some cases involving enquiry of fraud, the charged officials argued that they have not seen the orders/or it has not reached to their office, although it was uploaded on India Post website. 3. 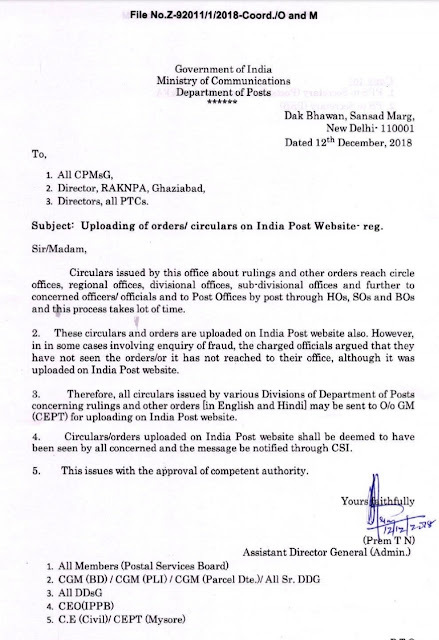 Therefore, all circulars issued by various Divisions of Department of Posts concerning and other orders [in English and Hindi] may be sent to O/o GM (CEPT) for uploading on India Post website. 4. Circulars/orders uploaded on India Post website shall be deemed to have been seen by all concerned and the message be notified through CSI.